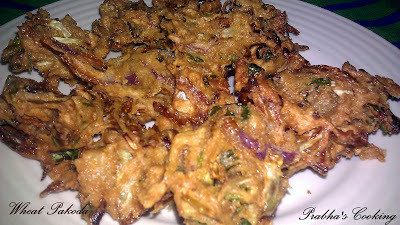 Last week one evening my hubby wants some hot cripsy snack to munch with Tea.Simply i tried pakodas with wheat flour and cabbage...My mom used to make Bondas with wheat flour.But i don't like that much.I want to make a crispy one for him,so i tried in my style.Result was very good..let's move on to the recipe now!! Take a wider bowl,add all ingredients except water, and mix well in hands. Sprinkle little water at once ,mix like semi chappthi dough. Heat oil in Kadai,once oil heated pinch the dough directly in to oil. Fry both the sides in medium heat,fry till all sides gets crispy. Then ,use spatula to drain the excess oil. Pakoras look yummy and crispy. Love them with tea. First time here .. following you. 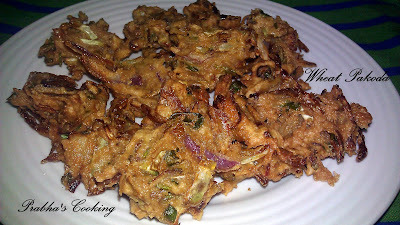 Wheat Pakoda luks crisp and crunchy.and healthy Pakoda recipe Dear.Luv it.